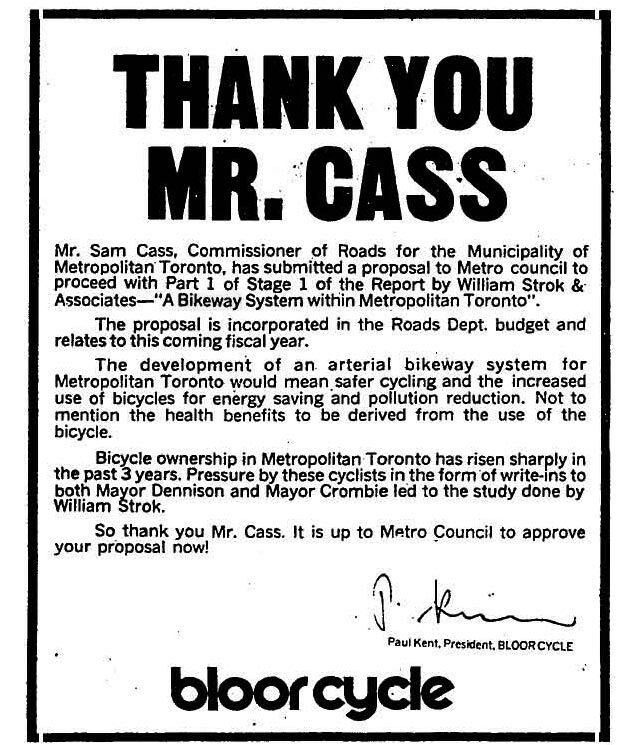 A look at the origins of Toronto's cycling infrastructure over 40 years ago. 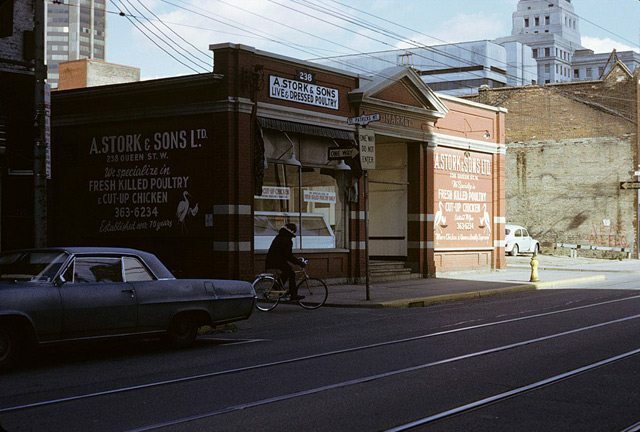 A cycling riding in front of St. Patrick's Market on Queen Street, 1970s. Photo by Ellis Wiley. City of Toronto Archives, Fonds 124, File 2, Item 125. Maybe in 30 years or so our children’s children will run up from the basement to announce the discovery of a rusting bicycle. Did we really ride bicycles back then, all that long ago? And maybe we’ll tell them about the great fad of the early Seventies, when businessmen and aldermen and all sorts of other Torontonians actually rode bicycles to work, doing their bit for ecology and physical fitness…On the other hand, we may be in the throes of something other than another fad. Let’s hope so. Let’s hope that the non-polluting, compact, maneuverable, healthful bicycle will continue to grow in popularity. While cycling has proven stronger than a passing fad, there have been moments where it feels like members of the current City Hall administration wish it was. 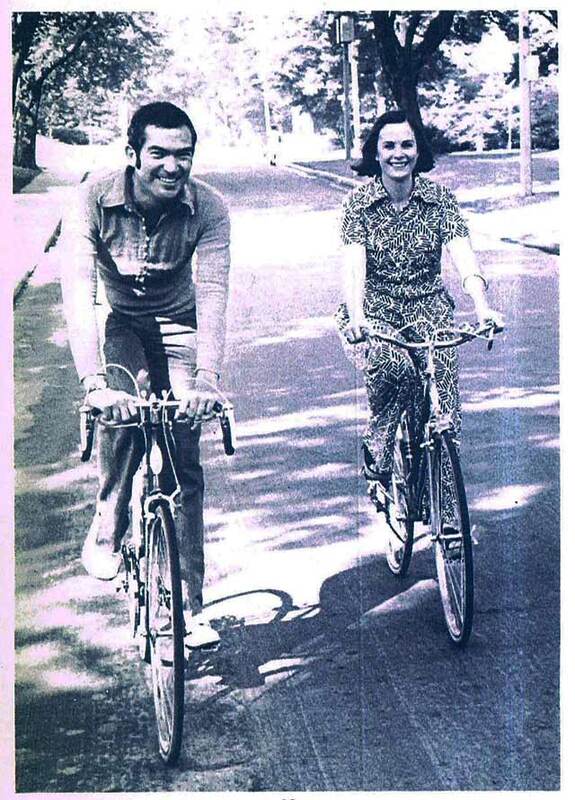 Yet when the Kaplans published their guide for city cyclists in 1972, there were many signs that officials, even suburban ones, were alerted to the future needs of two-wheeled riders. In a 1971 interview with Star columnist Alexander Ross, Metro Parks Commissioner Tommy Thompson observed that local geography made cycling downtown impossible. “If I asked somebody to ride from Front Street to Queen’s Park,” Thompson noted, “do you know what would happen? The average person would be dead—and not from the traffic. The average person would be so tired from the upgrade that he’d end up walking.” Ross disagreed with Thompson`s contention, noting that he rode daily from Bloor to King and “was not even puffing.” We also suspect aldermen like William Kilbourn and John Sewell, who cycled to work at City Hall, might have taken issue. Thompson’s department was probably happier if people walked anyway—apart from a couple of short trails such as one along Mimico Creek opened in 1965, cyclists were prohibited from riding off-road in all parks across Metro. 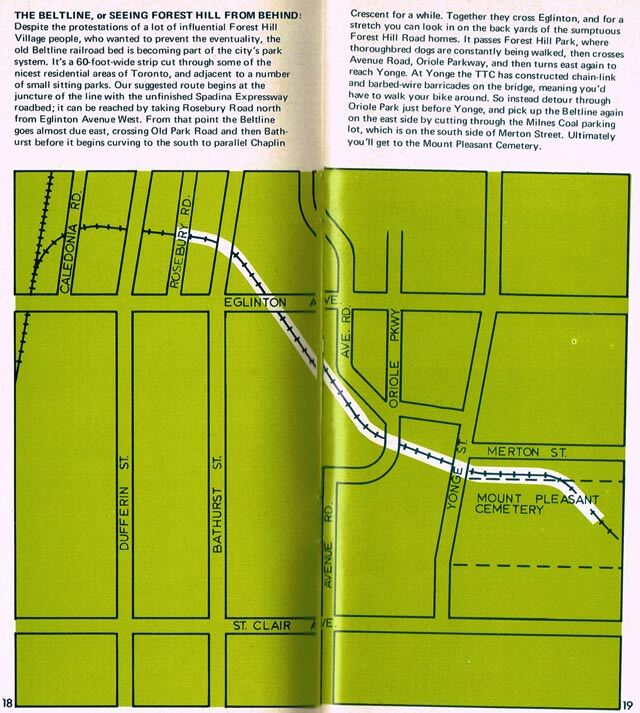 A bicycle tour along the Belt Line as proposed in Bicycling in Toronto (1972 edition). Note suggestion to ride through Oriole Park, which was illegal. After two years of talks, Toronto City Council approved a land swap with CN in October 1972. In exchange for the title to Union Station (which CN and Canadian Pacific intended to demolish as part of the never fully realized Metro Centre project) and a parking lot at Lake Shore Boulevard and Yonge Street, the City received the Belt Line and the future site of Roy Thomson Hall. Among the boosters of turning the rail bed into a bike path was alderman David Crombie, whose election as mayor soon after may have raised the hopes of North Toronto cyclists. Though it took a few years, both green space and a path were built and eventually named after park proponent Kay Gardiner. 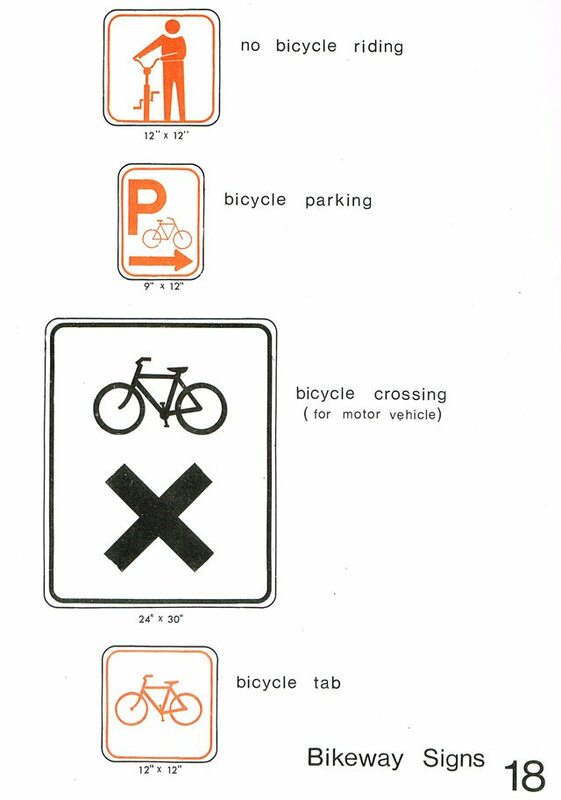 Bikeway signs proposed in Bikeway System Within Metropolitan Toronto, 1974. The possibilities surrounding the Belt Line weren’t the only promising signs for cycling infrastructure in 1972. That May, Metro Council’s transportation committee approved a bike path running along Eglinton Avenue between Martin Grove Road and Islington Avenue. Metro Roads and Traffic Commissioner Sam Cass indicated the Eglinton pilot would determine any traffic regulations introduced to future trails. By October the committee, under strong urging from East York Mayor True Davidson, instructed Cass to initiate a study to plan a Metro-wide “bikeway” network. In eastern Scarborough, the Metro Parks Committee approved construction in June 1972 of a bike path along Highland Creek. This route was intended to connect with a path previously approved by Scarborough council which would stretch from Ellesmere Road to Markham Road. The new path was built by the Scarborough branch of Pollution Probe and funded by a mixture of federal and provincial grants, donations of materials from the road construction industry, and fundraising events like a bike-a-thon to Ontario Place in September, which drew 1,000 participants. 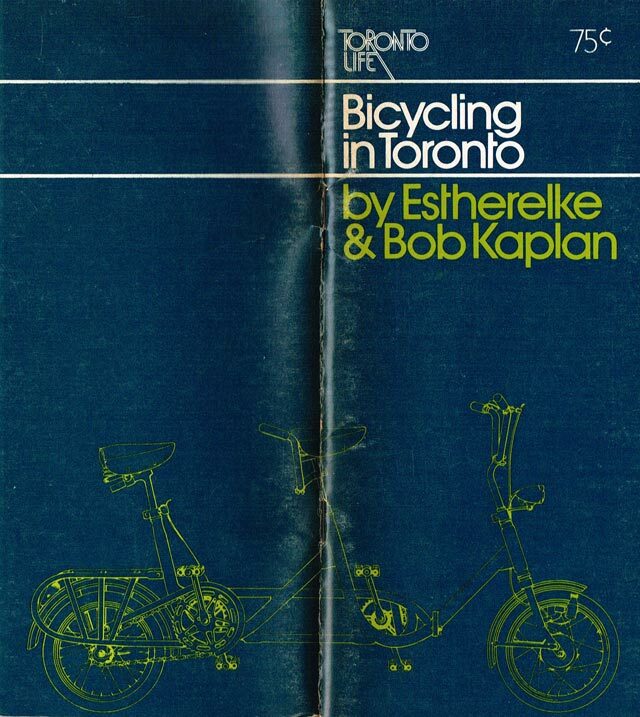 Cover of the 1972 edition of Bicycling in Toronto. It’s possible some of those participants might have flipped through Bicycling in Toronto before their ride. Published by Toronto Life, the guide offered cyclists tips on rules of the road, rental locations, maintenance tips, and many tours around the region. It noted the dearth of bike racks, a problem authors Estherelke and Bob Kaplan tried to tackle by urging the post office to install them as a public convenience at their Metro locations. Private parking lot chains they talked to weren’t interested in providing space for bicycles—“For one thing, they feel guilty about charging for such amounts of space, and for another they don’t want the responsibility of protecting bikes from theft and damage.” They also discovered many managers of high-rises wouldn’t install racks unless there was sufficient demand from tenants via petition. One private company was praised for its extensive use of racks: McDonald’s. Map of routes proposed in Bikeway System Within Metropolitan Toronto. The Globe and Mail, June 11, 1974. 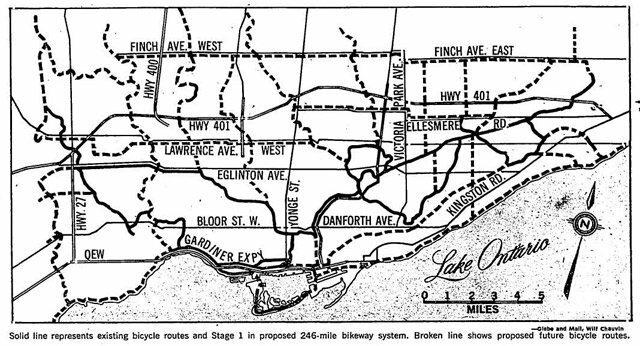 Released in spring 1974, Strok’s report, Bikeway System Within Metropolitan Toronto, recommended the construction of a 246 mile system across Metro Toronto in stages. The first stage consisted of six routes, the longest of which stretched from Eglinton Avenue and Highway 427 to the Metro Toronto Zoo via a diversion through Queen’s Park. Over the long term, routes needed to provide easy access to recreational areas, schools, downtown, and shopping areas like the Golden Mile and Six Points. The network should also tie into larger provincial bicycle routes, such as a “Lakeshore Route” he envisioned running from Niagara Region to Kingston. Strok advocated routes that offered as few intersections as possible to create safer riding conditions by using parklands, parallel routes along major roads, and hydro corridors for the bikeway. He suggested that riders could utilize sidewalks in low-traffic areas, as he felt riders could co-exist easier with walkers than other vehicles. Portion of a cross-section of a bikeway from Bikeway System Within Metropolitan Toronto, including a couple who might have disturbed opponents of a Belt Line path. The report recommended licensing as both a method of raising revenue to build the network and to make cyclists fully aware of the rules of the road. Children would undergo three levels of graduated licensing, while those with motor vehicle licenses automatically qualified to ride bicycles anywhere, though driver training would now include a section on cycling. Beyond licensing, other suggested funding methods included general revenues and property taxes, and subsidies from higher levels of government. To provide relief for users, Strok proposed building convenience facilities like bathrooms, newsstands, refreshment stands, and water fountains along the routes. Since winter was deemed too harsh for normal cycling, it was suggested Metro could avoid clearing paths and use them for cross-country skiing. Advertisement, the Globe and Mail, February 20, 1975. Due to demand from governments and citizen groups around the world, the 700 copies of the report quickly disappeared, prompting reprints sold for $25 apiece. Its findings were discussed over the next year, with critics pointing out its downplaying of commuting and fears over mixing cyclists and pedestrians on sidewalks. If nothing else, the report built momentum—in June 1975, Metro Council approved a $1.8 million budget to build a 100-mile bikeway network by 1979. The first approved route ran from Eglinton Avenue and Islington Avenue through the Humber Valley to the lake, then east to Lake Shore Boulevard and Bathurst Street. That summer also saw a nine-mile test route along city streets from Lawrence Avenue to Lake Shore Boulevard, which incorporated future bike lane arteries like Russell Hill Road and St. George Street. The popularity of cycling received a forced boost thanks to a 23-day TTC strike during the summer of 1974. Phones rang off the hook at bike shops across the city as frazzled commuters purchased new sets of wheels or pulled their old cycles out of storage. Bloor Cycle co-owner Peter Kent told the Star that “because of the repair volume, customers have to wait two or three days instead of getting same-day service.” While some chains, like Simpsons, saw their bicycle sales more than double, others like Eaton’s were ill-prepared to meet the sudden demand. It didn’t help that local manufacturer CCM’s plant in Weston was retooling for new models and couldn’t resume production. Bob and Estherelke Kaplan enjoying a ride. Bicycling in Toronto (1975 edition). Additional material from Bicycling in Toronto by Estherelke and Bob Kaplan (first edition Toronto: Toronto Life, 1972; second edition Toronto: Greey dePencier Books, 1975), Bikeway System Within Metropolitan Toronto by W. Strok & Associates Limited (Toronto: Metropolitan Toronto, 1974), the May 30, 1972, August 29, 1972, September 18, 1972, October 13, 1972, and May 18, 1974 editions of the Globe and Mail, and the August 12, 1970, August 22, 1970, October 13, 1971, May 12, 1971, September 16, 1972, August 20, 1974, and July 12, 1975 editions of the Toronto Star. Thanks to Astrid Idlewild for archival photo suggestion.